Digi recently introduced a new broadband plan for PC & Tablet from as low as RM20 for a starter pack. The pack comes with 1GB of internet that is valid for 30 days and is available for purchase immediately on the telco’s online store. The new prepaid broadband plan from Digi is an online exclusive offer. After the promotion period, each RM20 starter pack will come with 500MB of internet and 25 days of internet access. Want more internet? 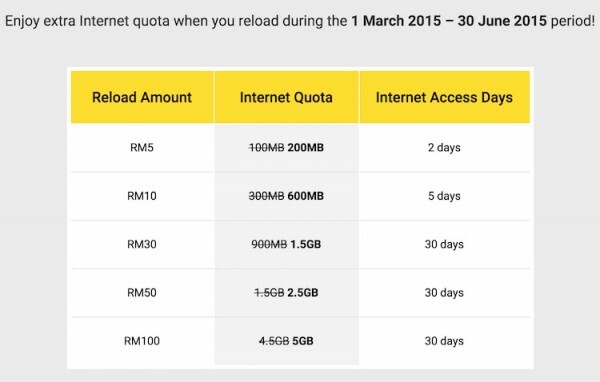 From 1 March 2015 to 30 June 2015, the telco also offers extra internet quota each time you top up from as low as RM5 for 200MB of data with 2 days validity. That’s not all, if you top up every month, the telco will reward you with even more data each month. Reload RM30 or more every month to receive either 100MB extra of data from the 4th to 12th month, or free 200MB each month from the 13th month onwards. Of course, this prepaid broadband plan is for PC & tablets, which means that it does not require a monthly commitment fee, giving you more flexibility. “We continue to introduce a variety of products and services to cater to the needs of our different customers. It is in line with our aspiration to enable Internet For All, which is deeply rooted on the principle of affordable access for broadband and mobile internet services. In the coming weeks we will be bringing interesting new value offerings to make it easy for Malaysians to access the internet.” – Hammad Kabir, Head of Prepaid, Digi. Check out Digi for more information about its new affordable broadband plan.